This happy little Bluetooth device is, as far as I can tell, magic. It does not have secure pairing, so there is no need for entering numbers as with a lot of headsets. Right out of the box there is a stereo audio cable with standard red/white RCA ends on one side and a 3.5mm plug on the other. For some reason I was hoping HDMI but that stems from judging a book by its cover as the box has a picture of a TV in the background on the front of the box. Also included is a standard, generic, USB-to-micro-USB cable, and the power adapter to plug the USB into. Also on the reverse of the unit is a digital optical port. After unboxing and staring at the contents, I plugged everything in. Simple. USB micro male into USB micro female. USB into power adapter. Power adapter into power strip. 3.5mm into jack. RCA into RCA ports on the back of my TV formerly occupied by my Wii. Nothing. No lights. No beep. Nothing. Not happy. Then I realized I’m an idiot. 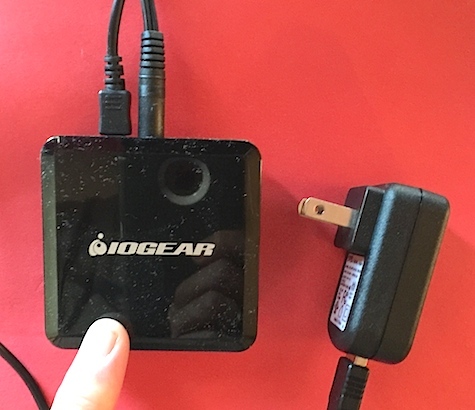 Turn Bluetooth on on my phone and there it is under my devices: IOGEAR TuneTap. Tap it and it says connected and a happy blue light on the top of the unit. Being the middle of the day and my family is around, I start with some generally accepted music. I play ABBA. Nothing like Dancing Queen playing from a 40″ screen while no signal bounces around. So the music app works with it. Later I have a chance to have the house to myself. I decide to try other apps with the TuneTap. First I connect to the device then I open Downcast. Pick the latest podcast. Wanting to test the range I put my phone in my pocket and go to the kitchen to clean up after dinner. The kitchen is about 30 feet from the TV so I don’t expect much of a problem. Everything is fine until I move from the sink to put stuff away. As soon as a wall interferes with the signal it begins to stutter. Not that I’m overly surprised; it is Bluetooth after all. It isn’t until I go to the bedroom which is probably more than 40 feet away that I lose signal completely. Apparently two doorways are too much. Knowing that Bluetooth standard has a range of 30 feet I can’t be too disappointed. I loaded up a movie on a whim. The sound played great from the big TV while watching the video on a 6.5″ screen. Interesting experience. 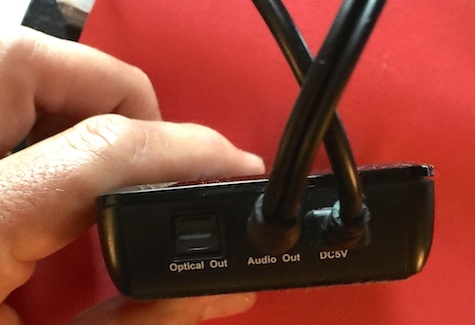 Although this device has an optical digital out I was unable to test it as my TV does not offer optical in and my digital headphones are in storage and are not readily accessible. I think this device is excellent. I give it a 9 out of 10 MyMac review rating.